On March 11, 1964, Gene Roddenberry handed in the first draft of his Star Trek proposal to NBC. The cast is almost entirely different, but the gist of the show is intact — truly a fascinating "what if." STAR TREK is a "Wagon Train" concept — built around characters who travel to worlds "similar" to our own, and meet the action-adventure-drama which become our stories. Their transportation is the cruiser "S.S. Yorktown," performing a well-defined and long-range Exploration-Science-Security mission which helps create our format. The year is "Somewhere in the future." It could be 1995 or maybe even 2995 [...] The "skipper" [is Robert M. April], almost thirty-four, Academy graduate, rank of captain. Clearly the leading man and central character. This role is designated for an actor of top repute and ability. A shorthand sketch of Robert April might be "A space-age Captain Horation [sic] Hornblower." If you've never seen this, it's definitely worth a peek. 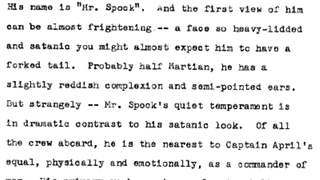 You can read more from this draft — including a description of a "Satanic" Mr. Spock — via this PDF.